With Wendy and Richard Pini’s “Forty Years of Pointed Ears” 2018 tour in full swing, fans have questions about how things will work “on site.” I’ve attended lots of appearances with them, and I can share some observations on how things generally go. 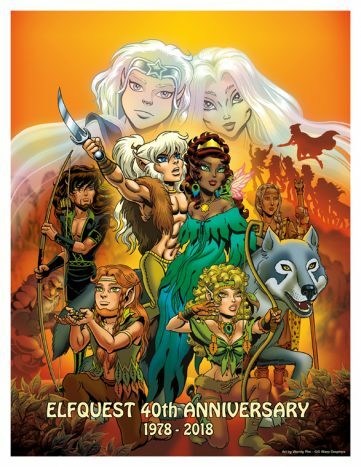 Most important, make sure you read all the info about the specific appearance you’ll be attending, both on the Elfquest “appearances” page (http://elfquest.com/appearances/) as well as on the specific con/show website. DO YOUR HOMEWORK so you don’t miss out. 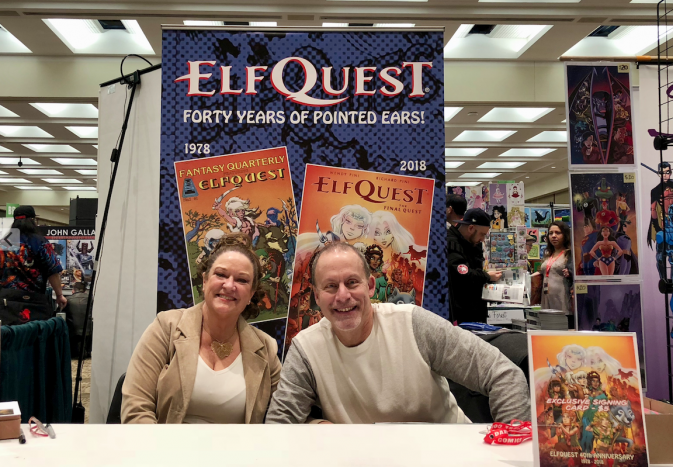 If you don’t have a book or comic for them to sign (and even if you do), you can purchase a special 40th-anniversary print for Wendy and Richard to autograph, while supplies last. 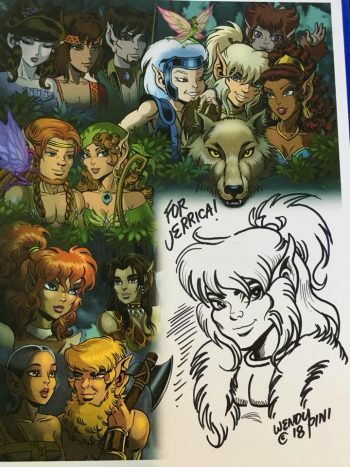 It’s 8.5 x 11 inches and features the cover art of Elfquest-Final Quest #24. They cost $5 apiece. Dark Horse Comics may have special publisher-only items available exclusively at their own booth for the Pinis’ signings. Again, Dark Horse will not be present at all of the appearances that the Pinis make on their tour, so check the listings. Wendy and Richard are really great about chatting with everyone who comes up to their booth or signing table. Don’t be shy! It helps to think of a question or something you want to share with them in advance. Just don’t loiter once you’ve had your chance. If there’s a big crowd, try coming back a little later. Many fans also want to know about these drawings–specifically, “Will Wendy be doing them?” If Wendy decides to do sketches at a particular appearance, there are some important rules. Sketches are done on a first-come, first-served basis and there is NO GUARANTEE that you will get one. Wendy can only draw so many per session. There will be set times each day when Wendy is sketching and you will need to visit their booth the day-of to find that out. Sometimes the answer will be “check back in an hour.” Be patient. Sketches are done only on pre-printed sketch cards which W&R provide. Sketches cost $50 and you can request a single favorite character. There is a limit of one sketch per attendee. You can pay with cash or credit–cash is preferred and exact change is greatly appreciated. Come prepared with your character request–don’t put it on Wendy to choose “whatever she wants.” Also choose a backup. If 6 people in a row request the same character, even Wendy will get fatigued! Or if it’s an obscure character that hasn’t appeared in 30 years, she might ask you to pick someone more familiar. Again, the policy is one sketch per person. You must be present to purchase a sketch. Richard (or a helper) will issue you a numbered ticket when you pay, to keep track of things. Don’t lose your ticket. Richard will collect it when you pick up your sketch. No commissions will be taken “to be done later.” You can get a sketch for someone else, but that counts as your “one.” If you are getting a sketch for someone else, know what character they want. Again, read the info on the appearances page linked to above for info on when, where or if Wendy will be doing con sketches. It will be different from show to show. If Wendy is not doing sketches, don’t walk up and ask if she will do you a sketch. It isn’t appropriate. DO NOT BUMP Wendy and Richard’s table while they are signing or especially if Wendy is sketching! (If you cause her to make a mistake on your sketch, “you broke it, you bought it.”) DO NOT DUMP your personal stuff on their table–it’s not a shelf or workspace for your backpack, stack of books, boxes or other stuff. About bringing gifts–the Pinis have requested that you please don’t do that, simply because they must travel to and from each show, and toting fan gifts is a challenge. PLEASE don’t bring perishable or food items. If you’d like to leave a card or letter with them, those are fine, and thank you. If you want a photo with Wendy and Richard, ask. If the table situation allows it, they’ll work something out–but realize tables are crowded and it may be impossible for you to come behind for a group shot. Also, conventions are notorious for germ-spreading and no one wants to catch “con crud.” Wendy and Richard have learned to be fist-bumpers, not a hand-shakers. It’s nothing personal.